A major study on student food insecurity and homelessness affecting students in the 23-campus California State University system was released recently as the CSU held a conference addressing the topic on Feb. 7-8 at CSU Sacramento. Humboldt State’s Oh SNAP! 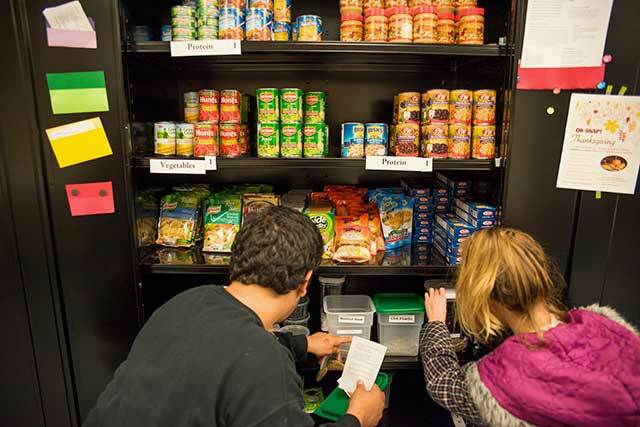 Campus Food Programs include access to a food pantry.Authored by Jennifer Maguire, a Humboldt State University professor of Social Work, and Rashida Crutchfield, a professor of Social Work at Cal State Long Beach, the study highlights the struggles many students face meeting basic needs. Among the findings: 10.9 percent of students faced homelessness at least once in the last year, while 41.6 percent had reported some level of food insecurity. The survey portion was conducted in late 2016 and early 2017 and was completed by nearly 28,000 students representing all 23 campuses. The research also includes findings from focus groups. The full study, as well as a report on assistance programs at campuses throughout the CSU, is available on the CSU Basic Needs website. Information about the conference is on the CSU Basic Needs Conference website. This new study is part of an extensive CSU effort to better understand the basic needs challenges facing students. Additional work is planned to evaluate student need and use of services, report on the status of support services throughout the system, and evaluate programs at two campuses – Humboldt State University and Cal State Long Beach.